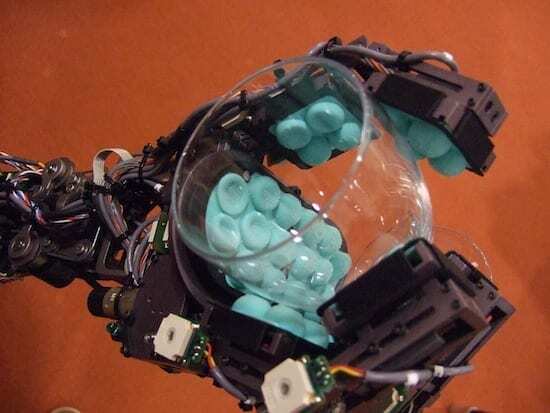 Eduardo Torres-Jara wants to expand the kinds of tasks robots can perform, by giving them more sensitive fingers. And his startup, Robot Rebuilt, is out making the rounds of Boston venture capital firms. While Tactico would have cameras to help it “see” an object in front of it, it would use those aqua-colored pads on its fingers to find the edges of the object, sort of the way humans use their fingers when groping in the dark for an alarm clock on a bedside table. Inside each pad is a sensor that can detect force, and understand which direction the force is coming from. That, says Torres-Jara, enables Tactico to pick up anything from eggs to wine glasses to paper cylinders.